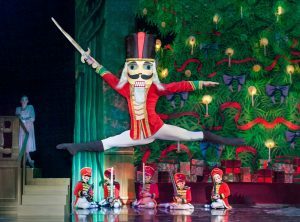 Inland Pacific Ballet returns to the Inland Empire this holiday season with its spectacular production of The Nutcracker, the classic holiday story danced to Tchaikovsky’s beloved score. Critically acclaimed Inland Pacific Ballet (IPB) brings The Nutcracker to life with dazzling sets complete with falling snow, an antique original Albany Flyer One Horse Open Sleigh, a 40-foot Chinese Dragon, beautiful costumes handmade in-house at IPB’s costume department, and a cast of over 80 dancers. New to this year’s production is a completely re-choreographed battle scene with additional characters and an ace battalion of mice. The Snow Scene will also feature the new principal role of an exquisite Snow Queen. IPB’s Nutcracker will have 12 performances in three theaters from November 26 through December 18, 2016 at Lewis Family Playhouse in Rancho Cucamonga, Riverside’s Fox Performing Arts Center, and Pomona College’s Bridges Auditorium in Claremont. This annual holiday favorite tells the story of a young girl named Clara who receives a magical nutcracker doll on Christmas Eve, and sets out on a wondrous journey to the Land of the Snow and the Kingdom of Sweets. A fantastic dream with battling mice, dancing snowflakes, waltzing flowers, and the delightful Sugar Plum Fairy stir the imagination. Meet the cast after the performance for photos and autographs. A dazzling holiday tradition for the entire family, see it again or for the first time and be swept away in a winter wonderland. This year’s cast features brilliant new talent from southern California, most notably Zachary Guthier and David Block, who both previously danced with Los Angeles Ballet; Devon Lux-Archer who began training at IPB and returns this year after completing a fellowship with the Atlanta Ballet, and Allynne Noelle, a returning favorite guest artist who currently performs with the Suzanne Farrell Ballet in Washington DC. Partnering with Noelle will be guest artist Thomas Garrett in the role of the Cavalier in performances at the Lewis Family Playhouse. Garrett was previously with the Richmond Ballet and is also a member of the Suzanne Farrell Ballet. IPB Principal Dancer, the exquisite Meilu Zhai of Montclair, returns to reign over the Kingdom of Sweets as the Sugar Plum Fairy. Meilu is a former dancer with the National Ballet of China and returns for her fifth Nutcracker appearance. In addition, IPB Principal Dancer Jonathan Sharp, brings an extensive professional resume that includes dancing with the Boston and Pennsylvania Ballet companies, appearances in original casts of several Broadway shows, and teaching as an Idyllwild Arts Academy faculty member. IPB is a professional ballet company based in the Inland Empire of Southern California since 1994. The Company is committed to producing exquisitely staged productions of full-length classic story ballets as well as presenting the best in contemporary choreography. Their large studio facility in Montclair also includes in-house costume and scenic departments. In addition, through creative marketing and an extensive Educational Outreach Program, IPB introduces young audiences to the magic of ballet, and makes the experience more available and accessible to all. For students pre-school through grade 12 enrolled in public, private and home schools, IPB offers “A Young Person’s Guide to the Ballet,” connecting the arts to learning through music and movement with five educational outreach performances scheduled for The Nutcracker. The Company is also committed to nurturing new talent and providing an essential training program for serious young dancers. Choreography for The Nutcracker is by Victoria Koenig along with pas de deux choreography by Clinton Rothwell and Nutcracker-Mouse King battle scene choreography by Zaylin Cano; Scenic Design by Nancy Seruto and Daniel C. Nyiri; Costume Design byJeanne Nolden; new Lighting Design by Eric Larson; and Music by Peter Ilyich Tchaikovsky. IPBs Founders/Directors Victoria Koenig and Kevin Frank Myers, are southern California natives who bring a wealth of experience to their visionary leadership of this young Company. Over the past 21 years they have built IPB into the premiere ballet company and a key creative force in the region, enjoying critical acclaim while performing the largest and most varied repertoire in the area. Victoria Koenig is a native of Los Angeles now residing in Claremont. After many years as a professional dancer, and extensive international travel as a guest artist and teacher, Ms. Koenig returned to southern California and has become a shaping force in the region’s dance community. She co-founded the Los Angeles Chamber Ballet, was on the faculty of the Stanley Holden Dance Center, and served on the dance faculty of California State University, Long Beach. Ms. Koenig has brought her many years of professional experience to the Inland Valley, one of the fastest growing cultural assets in southern California and is also on the dance faculty at Pomona College. Kevin Myers is a native of Riverside, California. He danced with the Houston Ballet in solo roles in the classic repertoire including Giselle, Swan Lake, The Nutcracker and Sleeping Beauty and in work created for him by Houston Ballet’s renowned Artistic Director, Ben Stevenson. Later as soloist with the Los Angeles Ballet, he danced principal roles in a variety of Balanchine ballets, including Tarantella and Jewels. As a Co-Founder and Associate Director of Inland Pacific Ballet and of the Inland Pacific Ballet Academy, Mr. Myers is fulfilling a dream of widening the opportunities for the young people of the Inland Empire to experience the art of ballet and providing local talent with the chance to pursue a career in the field. Final performances of The Nutcracker take place at Pomona College’s Bridges Auditorium, 450 North College Way, Claremont, CA 91711 on Saturday, December 17 at 2:00 p.m. and 7:30 p.m. and Sunday, December 18 at 2:00 p.m. Tickets start at $39 with senior/child/group discounts available. For more information and tickets, please go to IPBALLET.org.